As this goes to press, hundreds of thousands of United States troops are in harm’s way, as the war in Iraq continues. Our frequent and heartfelt prayers are for a quick resolution to this conflict, for safety for our young men and women, and for peace and freedom for the Iraqi people. We pray that God will guide our leaders, and that He will comfort those who do suffer the terrible loss that we know is inevitable. With so much attention focused on events on the other side of the world, we thank you especially for keeping in mind our mission’s needs, which continue day to day as we struggle to serve the needs of the remote villagers of western Alaska. May God greatly bless you for it! 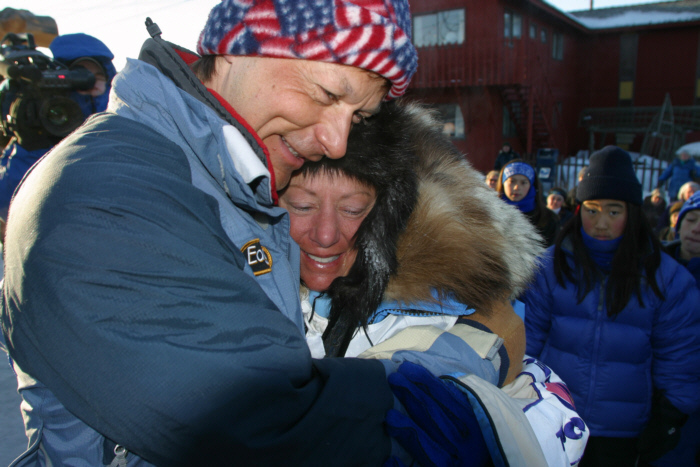 CANCER SURVIVOR: (left) Iditarod musher Dee Dee Jonrowe (at center) hugs four-time winner Martin Buser moments after she crossed the Nome finish line in 19th place. It was Jonrowe’s 20th completion of the 1,000-mile race, and by far, her most difficult one. Last summer, she was diagnosed with breast cancer. She underwent double radical mastectomy, followed by months of chemotherapy. Throughout the fall and winter Jonrowe trained her team while suffering the pain and nausea and fatigue of treatment. Her final chemotherapy took place only six weeks before the start of the race, and most of Alaska hailed her a hero. “Isn’t God wonderful?” she said to KNOM news director Paul Korchin at the finish line, as she quoted the words of a hymn that helped her through twelve difficult days on the trail. (Left) A phalanx of reporters, including Paul Korchin, surround Jonrowe as she finishes in the brilliant March sun. 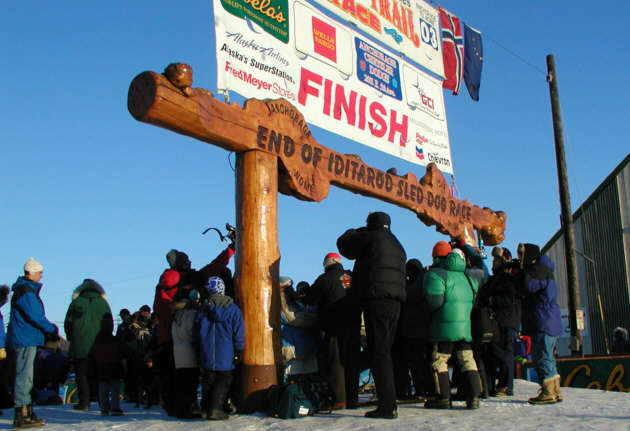 The Iditarod finish line is located on Front Street, Nome's main avenue, elevated on a ramp of snow. INSPIRATIONAL SPOT: Dear Lord, there’s a young man far from home, called to serve his nation in time of war; sent to defend our freedom on some distant foreign shore. We pray You keep him safe, we pray You keep him strong, we pray You send him safely home, for he’s been away so long. Dear Lord, there’s a young woman far from home, serving her nation with pride. Her step is strong, her step is sure, there is courage in every stride. We pray You keep her safe, we pray You keep her strong. We pray You send her safely home, for she’s been away too long. Dear Lord, bless those who await their safe return, bless those who mourn the lost. "C" Here! (left): In April 1993, contractor Randy Pomeranz (facing camera) and carpenter Fred Lammer prepare to install a second sheet of glass into the soon-to-be soundproof Studio C window. From inside the future Studio C, volunteer news director Cheri Collins looks on. 11 ft. square, C is KNOM’s largest studio. It’s been home to approximately 3,000 news and public affairs interviews and call-in programs since it was constructed ten years ago. To all who made this studio, and the new KNOM building possible, please know that we continue to keep you in our prayers. Please consider remembering missions like KNOM in your will. We prayerfully place all bequests into long-term savings for future major improvements, and to protect the mission against unforeseen emergencies. Your gift can make an immense positive difference in thousands of lives over many years. INSPIRATIONAL SPOT: The reign of God is far from being complete. Our world is full of broken promises and people with broken spirits. Even our villages are filled with families and neighbors who will not speak to each other. We are quickly seeing a generation of people, both native and non-native, cut off from their culture and their faith. Yet Jesus came to restore relationships among people and with God. The community of faith is commanded to follow the example of Jesus. If Christ can reach out to people whose lives are disordered and restore them to health, then those of us who claim to be His disciples must do the same. INSPIRATIONAL SPOT: Look at a woven basket’s design. From the simplest basket to the most complex, the ribs must be centered and held in balance. They are the fixed bearings that guide the whole rhythm of the weaving. If the ribs are out of balance, the whole basket is lopsided, uneven, off-center. Just like a woven basket, our life must have a fixed bearing -- Christ. 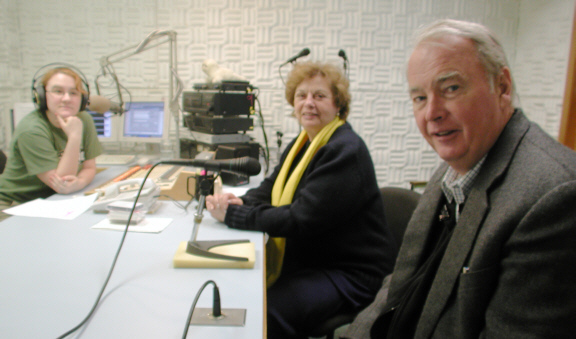 top (Left) In March, ALASKA GOVERNOR FRANK MURKOWSKI and his wife Nancy prepare for a KNOM interview with volunteer Julia Dunlap in Studio C.
Julia, who’s deputy news director, edited the 40-minute session into three parts, which we broadcast the following week. COUNTING BY THOUSANDS: Since January 1st, KNOM has broadcast about 11,300 inspirational spots, and 11,300 educational ones, too, thanks to you. COUNTING BY TEN: According to the National Weather Service, Nome’s temperature on March 20th, the first day of spring, varied from +10° to ­10°. That’s exactly 10° below normal. Brrr! EDGY: Off Nome, the edge of the stable Bering Sea ice is about four miles from the beach. Locals set pots beneath the ice to catch crab, which are small but abundant this year. Beyond that, you’ll find cracked ice pans, which shift and refreeze as leads of water open and close around them. In April, this is where you’ll find a variety of marine life, including sea birds and various species of seals. Later, as the main ice pack shrinks northward, you’ll see large herds of migrating walrus. THE OLDEST CATHOLIC RADIO STATION IN THE UNITED STATES, KNOM survives only by the kindness of individual contributors like you. We beam inspiration, education, the Mass, news, positive entertainment and companionship into isolated Eskimo and Athabascan Indian villages throughout 100,000 square miles of wilderness western Alaska. INSPIRATIONAL SPOT: The worst moment for an atheist is when he’s really thankful and there’s nobody to thank. top LOTS OF MUSH: (left) After more than 1,000 miles of trail, 18-year-old Cali King drives an enthusiastic Iditarod dog team toward Nome. King finished 32nd, 29 positions behind her dad, three-time race winner Jeff King. A total of 44 teams completed the Iditarod Race this year. In her first try at the Iditarod, Cali drove a team of her family’s young dogs in order to give them experience. As this photo was taken four miles from the finish line, her dogs were clocked at 14 MPH and were clearly enjoying the experience. As in past years, we broadcast the arrival of every team live, except for a few who arrived during our Rosary and Mass. For those, we taped interviews which we aired later. KNOM’s coverage of “The Last Great Race” helps bring great positive excitement to this region. Prior to KNOM listeners’ enthusiasm for the Iditarod Race, springtime in western Alaska was primarily known as suicide season. Thank you for assisting us in making this helpful, upbeat difference across this vast region. THIRTY YEARS AGO: April 3, 1973: The last of 22 mushers in the first Iditarod Race made it to Nome, having spent more than 32 days on the trail from Anchorage. These days, last place usually arrives within 14 or 15 days of the start. IRON A CHEESE SANDWICH? 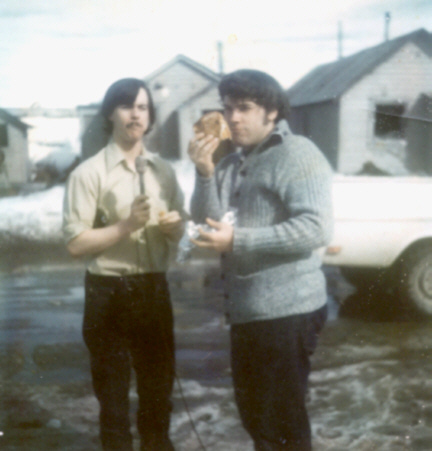 In April 1973, KNOM volunteer Jim Tighe produced an educational spot that described how a grilled cheese sandwich could be cooked using a clothes iron. He’d found the information in a pamphlet from the Government Printing Office. (Left) Challenged on the point, Jim ironed a grilled cheese sandwich on the front steps of the KNOM studio and fellow KNOM volunteer Tom Busch provided commentary live over the air. 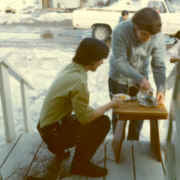 Several listeners stopped by for a bite. We thank you again, from the bottom of our hearts. Our success on the air is entirely dependent upon you. We continue to pray for you. God bless you!